The foot of Ferry Street has been an active fishing and sporting site for generations. 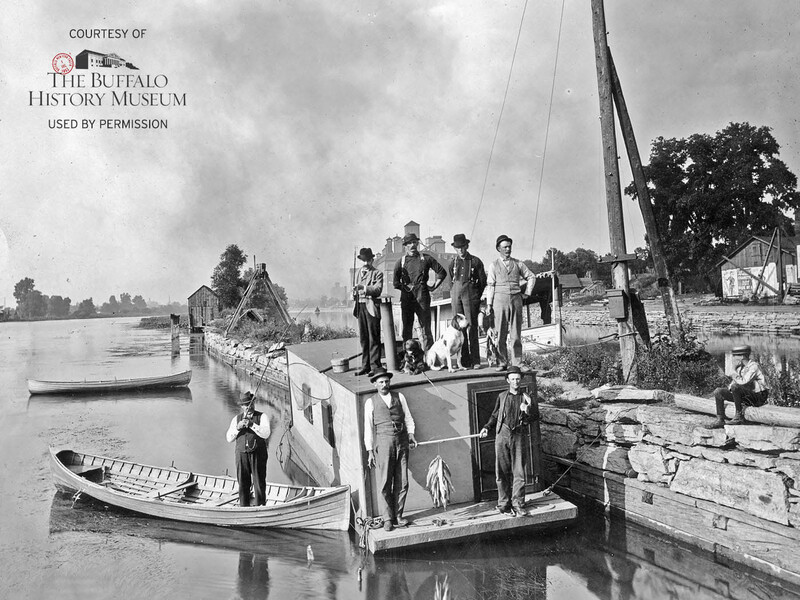 This circa 1900 view is looking north from the West Ferry Street Bridge, the Black Rock Harbor on the left, the Erie Canal on the right. Seven men and two dogs, with one boy looking on, get together to catch a mess of fish, perhaps some pike, perch, or bass that would have helped in saving money for food. A sign in the background says, “Admiral Cigarettes—NOT made by a TRUST.” Behind this view, looking south along the towpath, would have been the American Hotel, popular for fresh-caught fish frys. To the west, at the foot of Ferry Street, would have been the ferry to Fort Erie, Ontario, and the US Customs office. Along the towpath, a vibrant neighborhood of squatter shacks, boat liveries, bait and tackle shops, fishing clubs, and restaurants were targeted by a Depression-era canal filling and slum clearance campaign, and ultimately demolished in 1957 to make way for the I-190. Today, the foot of Ferry Street and nearby Bird Island Pier remain popular with anglers.